Join guild members and get a head start on Christmas gifts! Shirley Smith is leading us in a technique to sew and fold fabric that looks 3 dimensional! 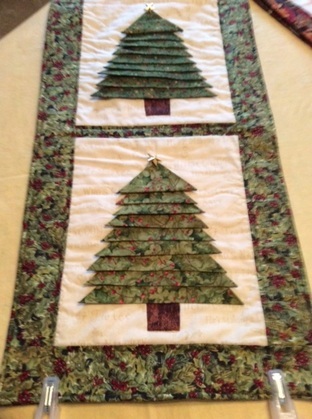 She sewed four and made a table runner. You could also make a wall hanging. This workshop will be on Tuesday, June 28 from 9-2 at First Baptist Church. Cost: $15.